Carpano Antica Formula - unusual vermouth from Fratelli Branca Distillerie. In 1786, Benedetto Carpano created a completely new drink - Antica Formula. His original recipe does not change until now. For the production of vermouth used carefully selected mountain herbs and flowers that give the drink rich, bright flavor and unique aroma. 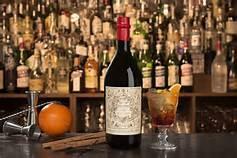 Carpano Antica Formula is usually served chilled as an aperitif or after meals. This Italian vermouth is ideal for making delicious cocktails. Thanks to its mild taste, Carpano Antica Formula emphasizes sound classic Americano and Negroni. One of the most popular drinks on the basis of Carpano Antica Formula - cocktail Prince of Wales. It is served in a prestigious lounge-bar at the Ritz in London. Carpano Antica Formula produce in limited quantities. Bottle shape for vermouth preserved from the 18th century, each of them is assigned a unique number.